Growing up in Vienna, Hubert was studying architecture when injuries and life signals awakened his spiritual calling to find healing. 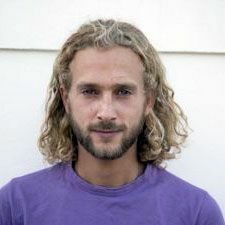 He began to study complementary medicine, different bodyworks, became a yoga teacher, Nuad-Practitioner, got the reiki master but still had the wish to dive deeper. He went to South America to live with shamans for a year and started to travel more and more to places of old knowledge in order to learn what all theses different wisdoms have in common. It was his way of healing himself that also brought beautiful insights, letting go processes and internal growth…on the way to realise who he really is. Today, he loves to work with the inversion therapy (Hangab) to help people let go, turn the world upside down, to see things from another perspective…and he loves to make music in groups and heal with singing. He tours the world to show and spread this old medicine of hanging upside down and offers workshops to teach others.